English teacher Ms. Olfky feels her textbook (left) should be available to students, too. Whether a class’ textbook is over 10 years old or the newest edition of the subject’s textbook, many students and teachers question the effectiveness in not only providing the background information needed for students to understand what their instructors are teaching them, but to make sure that information is current and correct. In Ms. Olfky’s Advance Placement (AP) English class, the class textbook set was published in 2008 and has been used since. While the the fundamentals of English haven’t changed very much in the course of 10 years, the sources and examples the text utilizes aren’t very relevant for the current Parkdale student. “I prefer my textbook, a more recent copy of the curriculum, as I see that it’s more current example [and] more engaging for my students,” said Ms. Olfky. In other classrooms, having more updated textbooks in their classes seems to be more detrimental than beneficial. Dr. Minkin is a biology teacher who doesn’t believe that his classroom textbook is effective at teaching his subject’s essential components. Due to his dissatisfaction with the textbook, Dr. Minkin would create his own slide shows and worksheets to teach his students, relying very little on the county-approved textbook. Both teachers have reasons for their class textbooks shortcomings. 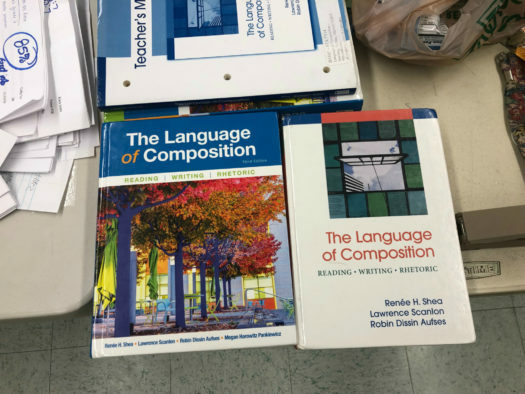 Ms. Olfky blamed it solely on the budget, and the lack of funds to get a whole class set of her prefered and more recent copy while Dr. Minkin has a more critical explanation for the textbooks defects. Now Dr. Minkin’s assertions of administratives mismanagement with the county’s textbooks aren’t more true than when delving in the class of Biogeochemical Systems. This class was first introduced this school year. The class is essentially environmental science but lacks a concentrated focus. The curriculum for the class itself wasn’t completed for the full year, but instead the school was given the first half of the first quarter with only four textbooks to get through the year. Having unfinished, outdated, and flat-out incorrect textbooks are harmful to the education that are given to students because the state, the county, and the school itself can’t expect a student to succeed if they are handing them the improper tools. Content and multimedia content © 2019 The Paw Print. All rights reserved.